It was something that I always wanted to do, and the timing was right. I wanted to engage directly with an audience, with no barriers or gatekeepers in between. Amazon made that process very easy. I felt that readers would let me know, with brutal honesty, whether or not I belonged in the game, so to speak. I was happy (and flattered) with the response I received on Luthecker. I’m not sure if I have a unique style, but I would say that my style is influenced by the likes of Neil Gaiman, and James Elroy. At least I’d like to think so. Elroy is very unique, and tough to emulate. Short, powerful sentences that paint big, vibrant pictures. And Gaiman is a brilliant world builder. Luthecker is a play on a biblical name. Can you guess what it may be…? I wanted something that would resonate in people’s minds, the main character sort of being an anti- Hannibal Lector. Primarily that the principles of cause and effect are always at work in our lives. If you choose to ignore this reality (and responsibility) it will only create suffering. And that everything / everyone is connected. It’s all there for us to see, we just have to choose to pay attention to it. More than would seem at first, both thematically and with the antagonist structure. The idea of corporate influence and control, often times to the detriment of the public, is nothing new, but now, particularly with the unpredictability of social media, it is visible in a far more brazen manner. And we are beginning to realize that with great power, comes great paranoia. And with great paranoia comes intense prosecution. I wanted to explore those very real themes in Luthecker. The protagonist of Luthecker, a young man named Alex Luthecker, can predict life outcomes by reading patterns of behavior. This is something we all do on some level. For example, (if you live long enough,) we’ve all known people whose reckless behavior would lead to their demise. It doesn’t shock you when they leave this world- You more or less saw it coming. I thought, what if, you take this to a different level of ability? To a different level of accountability? What if the lies people told, particularly to themselves, could be peeled away, exposing nothing but the truth? Who could handle that? And more importantly, who would want to stop this from happening at all costs? I think more of writers than specific works here, and that would be Neil Gaiman, Dan Simmons, James Elroy, and the great Stan Lee, the last of which I’ve had the honor of working with. If I could choose? Hemingway. I figure that would make for some crazy adventures as well! By Blood We Live by Glen Duncan. Part of Duncan’s Werewolf trilogy. That genre’s normally not my cup of tea, but Duncan’s writing is fantastic. I am reading a book by a new author named Aleta Mackey. It’s a gut-wrenching autobiography about turning the most dire life circumstances into a positive outcome. Well worth the read, but be ready. It will make you rethink what overcoming difficult circumstances in your life really means. I have a small fraternity of friends who’ve stuck with me through thick and thin, regardless of my endeavors. These folks are my family of choice. I would have begun the marketing process earlier, and with a bit more of an organized approach. There is a real system to it, and quite frankly, I still have a lot to learn. I have a real love / hate relationship with social media – I understand it’s necessity in today’s world, and how it connects people, but at the same time I’ve seen it create yet another false mask that people feel they must wear. And there can be a real addiction to it if you’re not careful. But the outreach it provides is critical in getting word out on your work. Probably when I read so many comic books as a kid! But probably on a more professional basis when I was in my twenties. I’m doing a script polish, and am in research mode for Luthecker: Revolution, the third book in the Luthecker series. I find that with the advent of social media, my attention span suffers. It just takes longer these days to settle down, put aside the distractions, and get to work. Once I do, I’m fine, but it seems to take a bit longer than it used to, because LOOK, THERE’S A CAT VIDEO, and those sorts of things. My favorites come and go depending on who I am reading at the time. I’m a Stephen King fan, I also like Barry Eisler’s work for its political thriller / action elements, I even went through a Rumi phase, but at the top I’d put Glen Duncan, at least for the moment. He has a command of his craft that I find to be just the right mix of cynicism and humor. I think his book “I, Lucifer” is just a blast. I do a lot of geographical research via Google. I would love to actually visit the locations in my book(s), but until then, I’ll just have to travel via the Internet. An exceptional young artist designed my book cover, and her name is Joleene Naylor. I’ve gotten many compliments on the Luthecker cover, and I’ve her to thank for that. I think the relentlessness that was needed. My pace is pretty slow compared to (what I’ve been told) is necessary in order to create a strong library of titles. I spend a great deal of time ruminating over characters and themes, and I’m kind of a research wonk. So it takes time for me. I’ve written two books now, and each time I’ve sworn it’s the last time, but I’m sure I’ll get “back in the saddle” again soon. 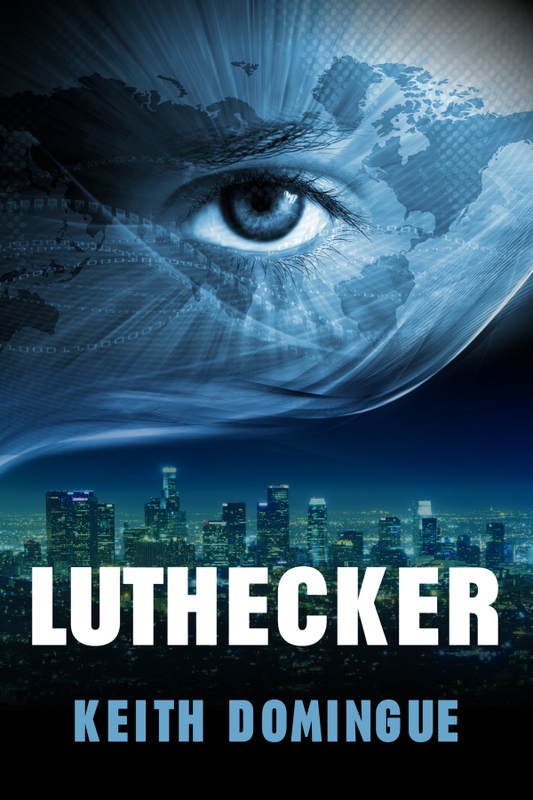 I kind of have to, as I promised many fans of Luthecker a third book in the series, and I don’t want to let them down! That you have to be relentless. Seek balance. Don’t just live in front of the computer screen. Be social, seek out different forms of expression and art, be it music, live performances, anything that tells a story. Thank you. Seriously. There are so many things one can do with their time, and I appreciate you using yours to read my book. I don’t remember the first book I read, but I do remember the first one that had a lasting impact, and that was The Sword of Shannara by Terry Brooks. That led to The Lord of The Rings, and so on. If I met the Buddha on the road, I’d stop and talk with him (not kill him, as the title of the book suggests…) And I’d ask him / her why? I did the best I could with what I knew. Because I did. Hiking. Martial Arts. Finding interesting Plays at odd venues. Spending time with friends. I think Game of Thrones is probably one of the best shows on television. I like Mad Men as well, and I thought Breaking Bad was fantastic. I think the best drama is on television, not necessarily film. I don’t go to the movie theater as often anymore because of that, but I do look forward to checking out Gone Girl. I would have remained in the health and fitness field. Folks in the fitness field (at least the ones that I am proud to call friends,) think in terms of (life) balance, health, and happiness. And they take that experience, and share it with others. If not for writing, that’s where I would be.